It's no secret that I love to eat and cook, and I am by no means a hamburger-and-hot-dog kind of girl. My husband and I (and for 5 days, two of our friends) camped and ate at Knight Island State Park in Vermont on Lake Champlain. Food played a key role in our vacation. My meals certainly did not lack in the protein department, but I was sure to include plenty of fruits or vegetables and lots of flavor in almost every meal I cooked. 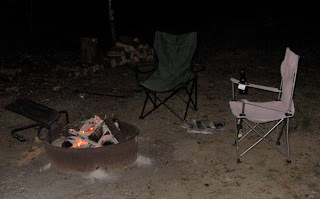 Are you curious about what we ate for 9 days of secluded and rustic camping? Well, then, read on . 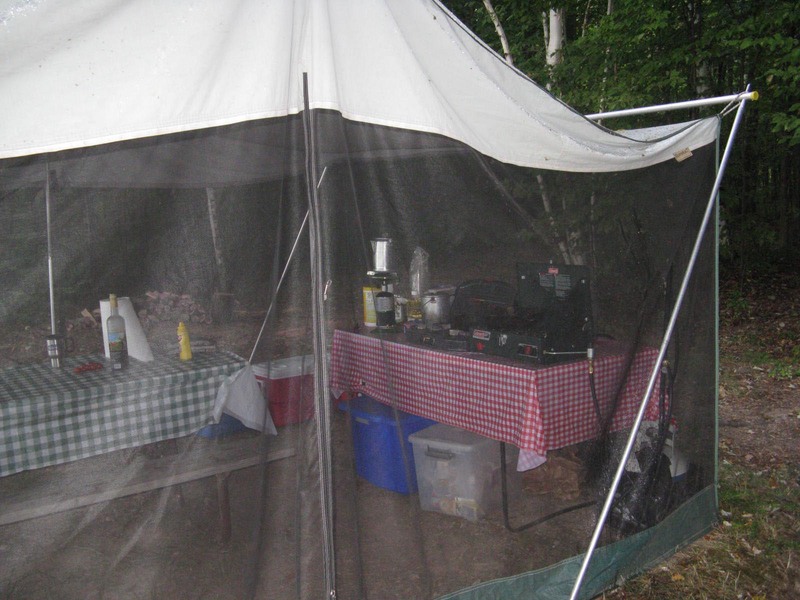 . .
My camping kitchen is housed within an older-than-my-mother screen house. 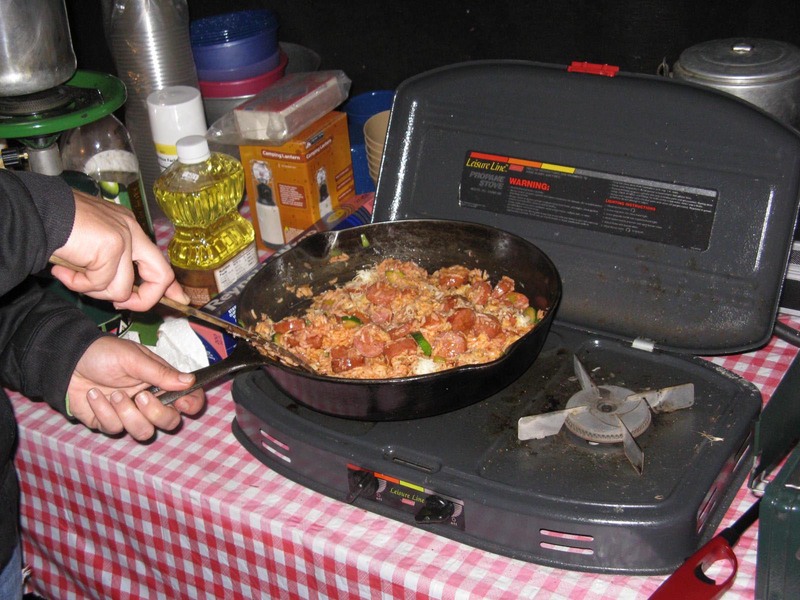 "They don't make ’em like they used to" applies to this fab piece of camping equipment. Camping breakfasts are the best; nothing beats the smell of bacon drifting through the morning air. Unfortunately, not all my breakfasts included bacon, but the others were just as tasty. We had French toast with real Vermont maple syrup twice. I also made pancakes twice: one of the pancake meals was served with bacon on the side, and for the other pancake meal I peeled and sliced fresh peaches, sprinkled them with cinnamon and sugar, sauteed them for a few minutes, then served them over the pancakes — Oh. My. God. Delicious! I replicated the peaches once again and served them over oatmeal. 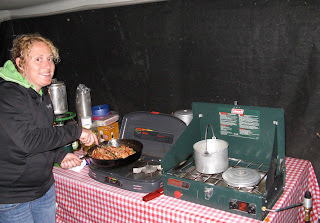 I also cooked traditional bacon and/or sausage, eggs, and toast a few times. The one unique breakfast I made was a duck, potato, and sausage hash using the previous night's leftovers. dry-food-storage totes tucked beneath the table. Lunches were the least laborious of the meals; in fact, they weren't quite meals. We ate mostly snacks for lunch, which included cheese, crackers, sliced sausage or bratwurst, pickles, hummus, pita wedges, grilled pita pesto "pizzas," deli-meat sandwiches, raw carrots, and chips. The evening dinners were the most creative meals I cooked. 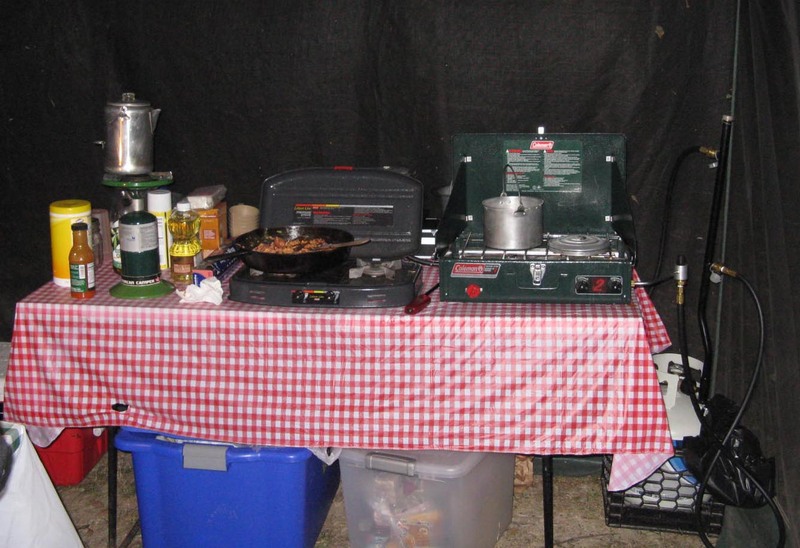 And with two double-burner propane-fueled camping stoves, a grill grate over the fire pit, various size pots, three cast iron skillets, and utensils galore, I wasn’t lacking in cooking equipment. With the exception of not being able to bake for lack of an oven, I didn't have any limitations in my camp kitchen. one for rinsing, and one for sanitizing. Here are some of the evening meals we enjoyed: pesto chicken with summer squash and green beans over couscous; chicken and vegetable stir-fry over jasmine rice with grilled corn on the cob; marinated, grilled, center-cut sirloin steaks with seasoned hot-coal-roasted potatoes; beef burritos with homemade salsa; pan-seared duck breast drizzled with a red wine/vinegar/shallot reduction and served with seasoned hot-coal-roasted potatoes; buffalo-sauced bratwurst and summer squash over rice and sprinkled with cheese; and a garlicky bratwurst with summer squash and green beans over couscous. And until I ran out of lettuce, each of the aforementioned meals began with a feta, tomato, lettuce, cucumber, and vinaigrette salad. 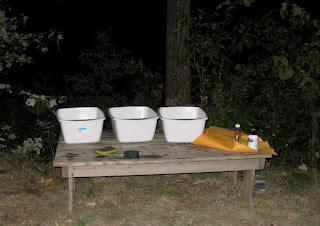 The picnic table doubled as my prep station. 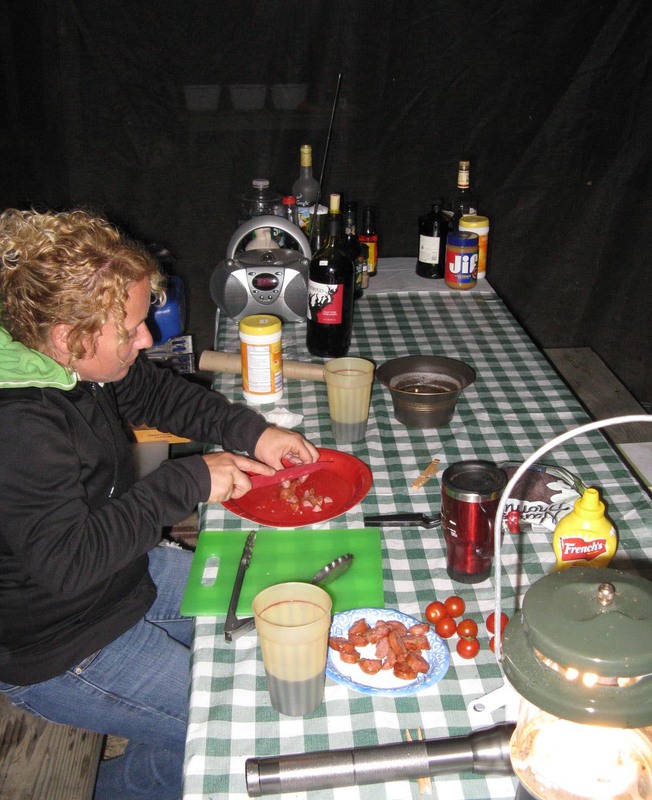 In this photo I am prepping the buffalo-bratwurst dinner. Stirring in the cheese — the final touch on my buffalo-bratwurst meal. Camping isn't for everyone. My husband and I can rough it up to a point — we bathed in the lake, we had no choice but to use an outhouse, we slept in a tent, we chopped our own wood, but we did not sacrifice by way of food, that's for sure! 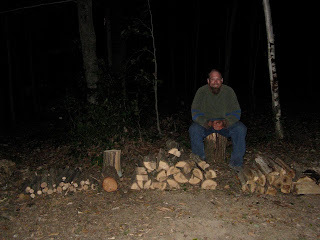 My husband with his dwindling pile of wood. and for grilling throughout our camping trip. I'm coming next year.... I got the wash station. Wow! I'm surprised you didn't have people coming from miles away and lining up outside your screen tent for one of those meals! Looks so fun! My husband and I went camping a few weekends ago on Cape Cod. It was absolutely fantastic!